Family, Orchis. Color, crimson and white. Leaves, 2, large, the largest 4 inches wide, 8 inches long, oblong or ovate, fleshy, shiny above, clammy, with smooth, wavy margins, arising from near the base of the stem. 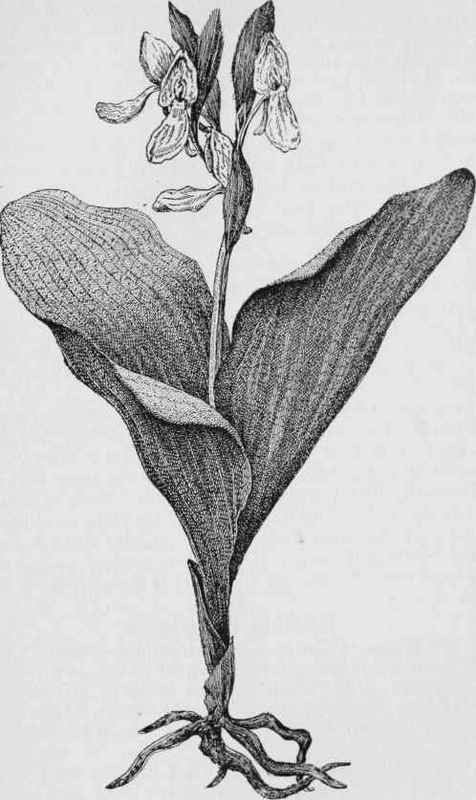 A low orchid, from fibrous roots, bearing a single flower - scape, with 3 or 4 rather large flowers, 1 inch long, at the summit. The Up is white, prolonged backward into a blunt spur, not notched or divided. The other petals and sepals lightly unite, forming a queer, pointed little hood or galea, which is dark, rich crimson, with a tinge of purple, in color. Capsules, 1 inch long. Height of plant, 6 or 7 inches. April to June. 0, rotundifolia.. - Color of sepals and petals deep pink, except the lip, which is white, spotted with purple. One roundish or oval leaf is borne near the base of the stem, with 1 or 2 sheathing scales below. Flowers, several, in a spike, at the end of a stem 8 to 10 inches high, from a creeping rootstock. May and June. Sometimes found in swamps, more often in damp woods from New England to Georgia, westward to Dakota.